Chocolate, roses and an unforgettable dinner for two. Celebrate a memorable Valentine’s Day with all the right ingredients. No need to whip up a love potion or count on Cupid. We have everything you need for a romantic and delicious Valentine’s Day—and dinner! Whether you’re looking for fresh, indulgent Chocolate Dipped Strawberries, a stunning bouquet of roses or a complete meal for two, The Fresh Market is the perfect place to find something for your sweetheart (or yourself). Searching for the perfect entrée? Impress the meat-lover in your life with an eye-catching favorite that tastes as good as it looks. Our Premium Choice Sweetheart Ribeye is striking on both plate and palate. Pair it with a deep, dark red wine, like Simi Landslide Cabernet Sauvignon—perfect for Valentine’s Day. Our Sweetheart Ribeye is available in stores from Friday, February 8th through Thursday, February 14th. 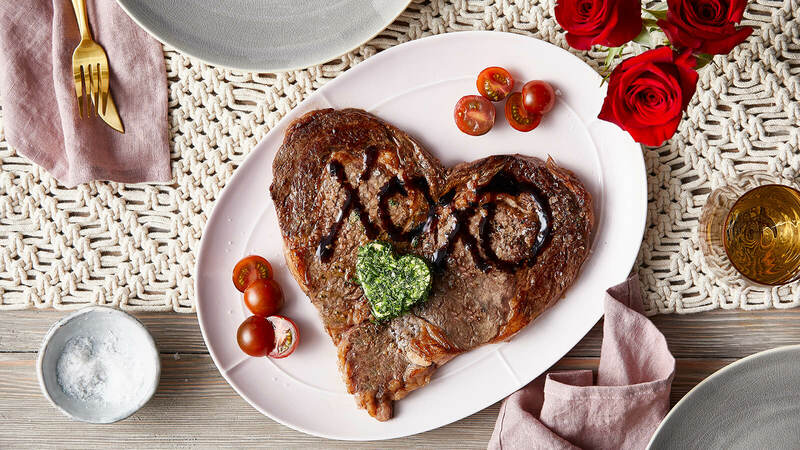 Follow these easy tips for cooking the perfect heart-shaped ribeye. Indoor Searing: Season steak generously with coarse salt and freshly cracked black pepper. Turn your stove exhaust fan on high. Heat a large, heavy skillet (cast-iron is best) over medium-high heat for at least 2 minutes. There is no need to add oil to the skillet. Add steak to the skillet. Cook until the underside is nicely browned, 3 to 4 minutes. Flip the steaks and continue cooking to your desired doneness, 3 to 4 minutes more for medium-rare. Remove the steaks from the skillet and let rest for 3 to 5 minutes. Pour any pan juices over the steaks and serve. Outdoor Grilling: Season steak with coarse salt and freshly cracked black pepper. Prepare the grill for direct cooking over high heat (around 550°F). Place steaks on the grill and close the lid. Cook until the underside is nicely browned, 3 to 4 minutes. Flip the steak over, cover and continue cooking to your desired doneness, 3 to 4 minutes more for medium-rare. Remove the steak from the grill and let stand for 3 to 5 minutes before serving. Whether you choose to cook your steak indoors in a skillet or outdoors on the grill, here are a few tips to ensure a great entrée every time. Brush with Shoyu: Shoyu is a Japanese aged soy sauce that’s much sweeter and more complex than traditional soy sauces. Earthy, elegant and delicate, shoyu is ideal for finishing steak. Simply brush with your shoyu of choice as soon as it comes off the grill (or pan). Top with Compound Butter: As soon as your steak comes off the grill (or pan), top it with a medallion of Roasted Garlic Butter. This ensures a tender, juicy steak with subtle sweet garlic flavor. Nothing says “I love you” quite like a vibrant, fresh bunch of roses! Ours are long-lasting and available in a variety of colors, lengths and arrangements. 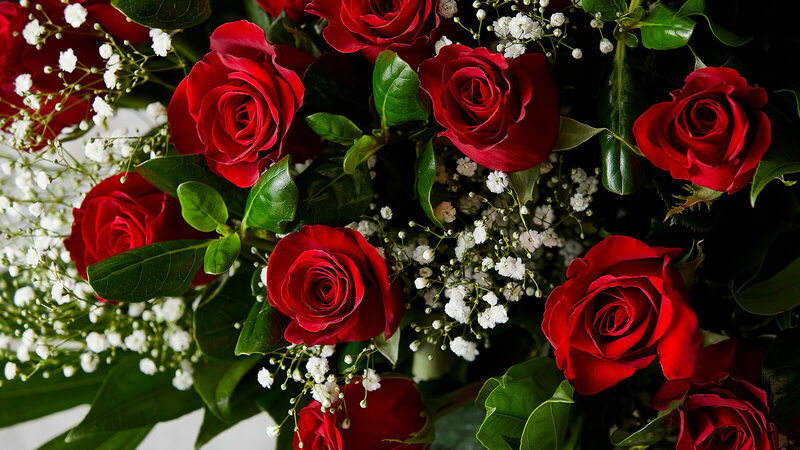 If you want to give your sweetheart a classic gift of one dozen roses, we offer an assortment of options, from bold red to stunning white. We also have long-stemmed roses that make an impression, as well as dozen rose bouquets with baby’s breath and greenery. If you’d like a vase with your flowers, we offer that, too! Looking for something a little different? Go all out with a bunch of spray roses featuring 100+ blooms, or choose a rose-lily or rose-hydrangea bouquet. And, if roses aren’t your Valentine’s flower of choice, we also offer a wide array of show-stopping orchids, vibrant tulips and more. Rose selections vary by store. Cook and serve a memorable Valentine’s Day meal with our easy cooking guide. Sweet on someone with a sweet tooth? We have just the thing! Our baked goods feature mouthwatering ingredients like plump, juicy strawberries and decadent cakes that are almost too pretty to eat. 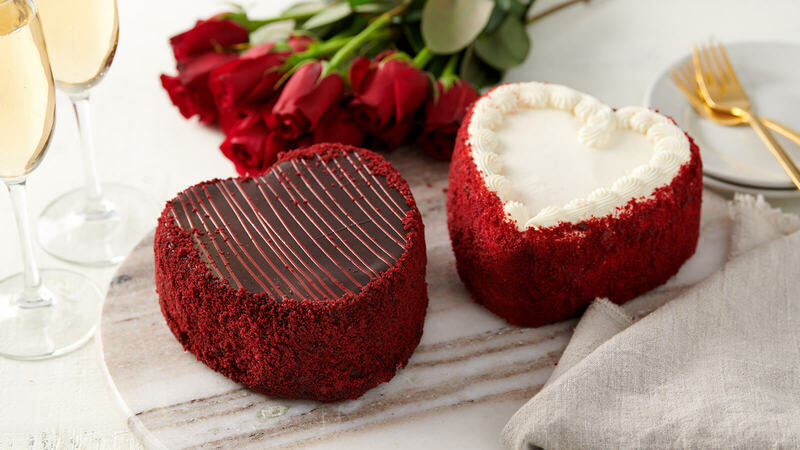 Try one of our gorgeous heart-shaped cakes in Red Velvet (layered with cream cheese frosting) or Chocolate with Red Stripes (featuring our award-winning cheesecake cloaked in a luxurious dark chocolate ganache and decorated with chocolate chips and red stripes). What’s not to love? Give the gift of classic decadence with our fresh, indulgent Chocolate Dipped Strawberries. Our bakers select flavorful, extra-large strawberries and dip them in white or dark chocolate. 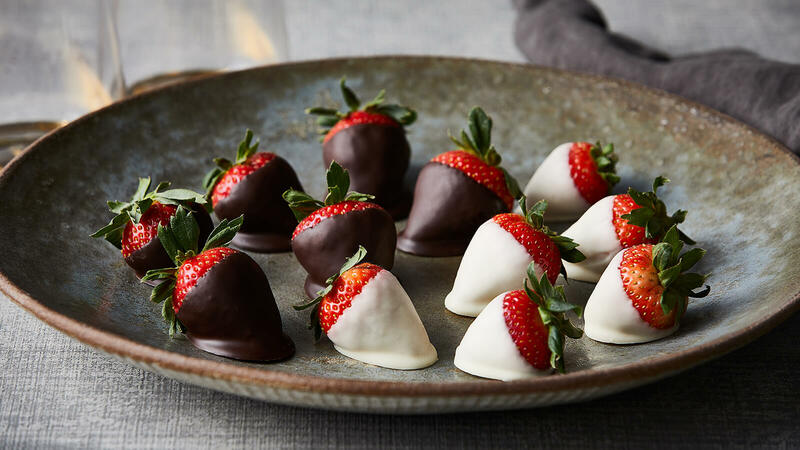 Available in stemmed 4-count and stemless 12-count, our Chocolate Dipped Strawberries are the perfect way to share a little or a whole lotta love this Valentine’s Day. You’ll need something to sip on while you spend time with your sweetheart. 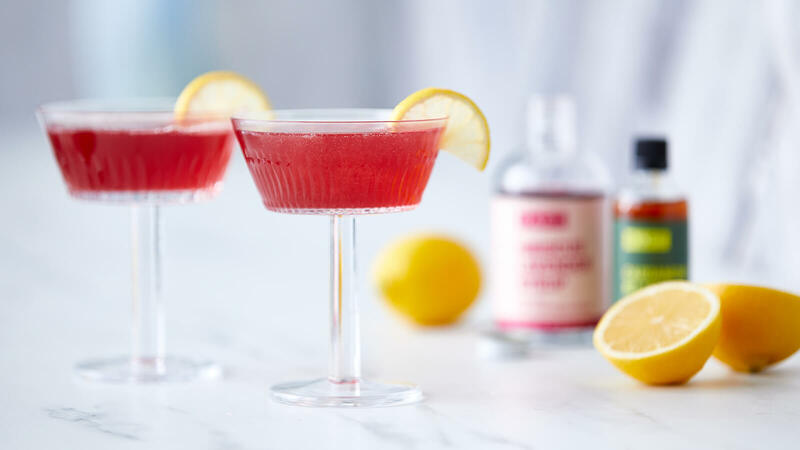 We recommend our pink Love Spell cocktail. Floral elements and botanicals come together with a hint of spice, thanks to RAFT Hibiscus Lavender Syrup, Cardamom Bitters and gin. A little lemon brightens everything up and a splash of sparkling water on top brings it all together. Whether you’re sharing the love with friends or doting on your valentine, you can’t go wrong with chocolate. Timeless and decadent, we offer a diverse medley of decadent chocolate assortments, perfect for every special person in your life. It’s time for you to try ruby chocolate. Rare and highly sought-after, its berry hue (which comes entirely from the ruby cocoa bean) is indicative of its unique fruitiness and luscious creaminess, punctuated with sour notes. 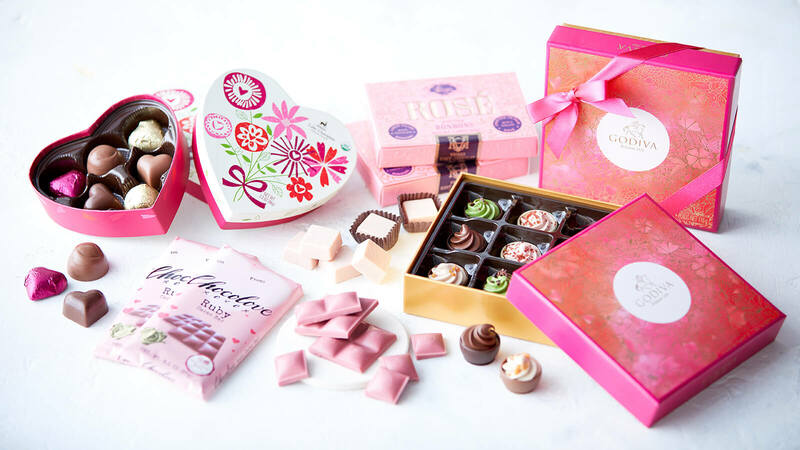 Vosges and Chocolove are two of the three chocolate brands to launch ruby chocolate exclusively in the United States. Vosges also makes Rosé Bon Bons featuring a honey-like, rosé-infused filling—perfect for pairing with your favorite rosé! For the traditionalist, one of the quickest ways to steal someone’s heart is to give them a beautiful heart-shaped box of tantalizing chocolates. Lake Champlain’s Organic Celebration Heart Box is filled with an exciting assortment of gorgeous truffles with delicious fillings like coffee, raspberry, salted peanut butter. This Vermont family company is dedicated to sourcing the best local, non-GMO ingredients for their high-quality chocolates. We also love Godiva’s new, limited edition Cupcake Chocolate Collection. Each box features delicate chocolate cups filled with a fluffy chocolate mousse that resemble tiny cupcakes. The flavors include classic chocolate mousse, strawberry coulis with white chocolate mousse, caramel mousse with coffee chocolate cream and matcha white chocolate mousse with 85% dark chocolate cream.